SPIRO®CAM is complete software dedicated to support manufacturers of HVAC plants. It is equipped with a wide library of parametric shapes customizable according to the projecting needs, and offers a CAM environment to automate the production process of sheet metal parts. 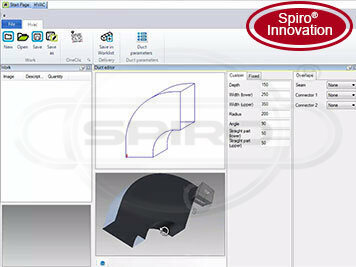 SPIRO®CAM library includes mainly three groups of shapes , rounded, conical, square and oval (like rings and flanges). Moreover, the software offers a wide variety of 2D shapes normally used in production. For any parametric shape, once this has been selected, it is possible to edit a set of dimensional and technological parameters; it will be thereafter possible to view the calculation of the 2D flattening of the part and the osition of opening, as well as the marking of the starting and end points of the generating lines. Once all parameters have been defined, the application will execute a render of the part to visualize this in 3D mode. Selected hapes are developed and registered in a production order. Once the production order has been defined, SPIRO®CAM will automatically create corresponding icons, generating related nesting and optimal cutting paths, ntil the creation of the cutting program suited for the used machine and the issue of detailed reports. SPIRO®CAM automatically splits those shapes which are bigger than the working area of the machine, in order to properly execute the production cycle. » Complete automation of nesting process - With the oneClicConcept philosophy, SPIRO®CAM allows a totally automatic creation of the elements forming a determined work. » Real-time unfolding - SPIRO®CAM allows to view the flat unfolding of the part in real time.